Shall Russians Praise or Curse 'Those Treacherous Yankees'? "We said, 'Let the Americans give up their missile defense program first'. And so it has happened - they have given it up. … This major diplomatic 'victory' denies Moscow what it had considered its most important foreign policy trump card." 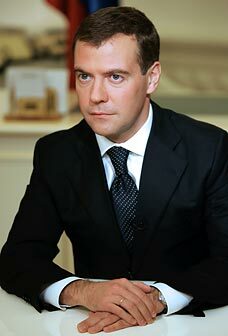 Russian President Dmitry Medvedev: Will Russia help President Obama deal with Iran's nuclear program? It is on this basis that his decision to scrap the East European anti-missile shield will be measured. Fear to dream, because dreams sometimes come true. The disgraced are those who for the past few years have asserted that Moscow has had no foreign policy successes, but rather an increasing number of failures. Just recently, Russia did indeed have a great diplomatic victory. Judging by press reports, the American administration will declare the indefinite freeze (and even abandonment) of plans to install elements of a global anti-missile shield in Poland and Czech Republic. For the past few years, the prospects of a so-called "third missile defense site" in the immediate proximity of Russia has been the main splinter in Moscow-Washington relations. All these years, Russian leaders have shrieked from every street corner that the appearance of ten American interceptor missiles present a dire threat to our country. Attempts by the U.S. to explain that ten interceptors would hardly threaten the strategic balance, since at the moment Moscow has about 3,000 nuclear warheads (and will have no less than 1,500) smashed into a wall of demonstrative misunderstanding. Moscow claims that this third missile site could become the harbinger of an aggressive program as a result of which Russia would be surrounded by hundreds of anti-missiles. Moreover, in the course of the debate over this, another exotic argument was also attempted: that those cunning Americans could surreptitiously equip the interceptors with nuclear warheads, turning them into medium-range missiles aimed at Moscow. Attempts by experts to explain the impossibility of doing this in secret and that testing would be needed were dispensed with. And now, let the happiness commence. The Americans have decided to abandon the type of missile defense deployment that so irritated Moscow. But it would be interesting to know whether they are drinking champagne in the offices on Smolenskaya Square and Arbat Street. [near the Russian Foreign Ministry]. Or, perhaps, they are quietly cursing those treacherous Yankees who have once and for all managed to get the ball on our side of the court. After all, with little effort and at the right time - the ABM bugbear could always be taken out to demonstrate to the Russian people how we're about to be surrounded. It allowed us to set aside contemplating a constructive program of strategic cooperation. We said, "Let the Americans give up their missile defense program first." And so it has happened - they have given it up. What happens in the upcoming weeks and months will reveal, one way or another, the true purpose of our policy. Obama’s decision opens the way for rapid progress on several fronts simultaneously - first of all, in the clearly stalled negotiations on a new Strategic Offensive Reductions Treaty. Russia can now, saving face, make concessions on the so-called return potential (the United States wants to count only nuclear warheads that are already installed on missiles, and remove from the overall count those which are still in storage). More flexible rules on counting missiles could be agreed to. In addition, Moscow could support possible sanctions against Iran, which has thusfar been unwilling to give up its nuclear program. However in this case, it's not clear how to such a policy change would match up with recent statements by Vladimir Putin that such sanctions are counterproductive and that Russia doesn't support them. However, another option is possible: we can invent a new reason to be offended by the United States. It's clear that in principle, the U.S. won’t abandon its anti-ballistic missile program (and that it will continue with two sites - in Alaska and California). All that will change is its structure. There is, for example, talk of making the main element of the program AEGIS-equipped ships with "Standard-3" missile interceptors. Why not announce that the inevitable concentration of U.S. naval power “near our borders” is a threat? We could demand the complete dismantlement of the U.S. ABM program. We could demand the closure of American bases in Bulgaria and Romania. Many things could be invented if there is a desire to do so. Be that as it may, this major diplomatic "victory" denies Moscow what it had considered its most important foreign policy trump card.